Antarctica. A seemingly impregnable fortress of cold. Ice mountains rising 2,100 meters high. Circumpolar winds raging out from this mass of chill frost walling the warm air out. And a curtain of sea ice insulating the surface air and mainland ice sheets from an increasingly warm world. A world that is now on track to experience one of its hottest years on record. Antarctica, the coldest place on Earth, may well seem impregnable to this warming. But like any other fortress, it has its vulnerable spots. In this case, a weak underbelly. For in study after study, we keep finding evidence that warm waters are rising up from the abyss surrounding the chill and frozen continent. And the impact and risk to Antarctica’s glacial ice mountains is significant and growing. For a study this week confirmed that Antarctica is now seeing a yearly loss of ice equal to one half the volume of Mt Everest every single year. A rate of loss triple that seen just ten years ago. An acceleration that, should it continue, means a much more immediate threat to coastal regions from sea level rise than current IPCC projections now estimate. 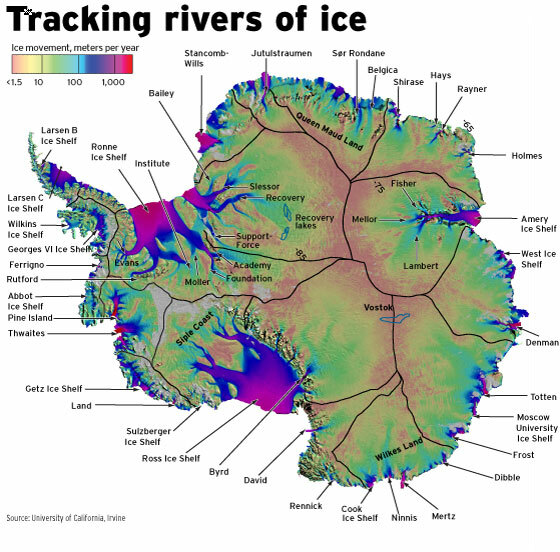 The source of this warm water comes from a deep-running current that encircles all of Antarctica. Called the Circumpolar Deep Water, this current runs along the outside margin of the continental shelf. Lately, the current has been both warming and rising up the boundaries of the continental zone. And this combined action is rapidly bringing Antarctica’s great ice sheets under increasing threat of more rapid melt. According to a new study led by Sunke Schmidtko, this deep water current has been warming at a rate of 0.1 degrees Celsius per decade since 1975. Even before this period of more rapid deep water warming, the current was already warmer than the continental shelf waters near Antarctica’s great glaciers. With the added warming, the Circumpolar Deep Water boasts temperatures in the range of 33 to 35 degrees Fahrenheit — enough heat to melt any glacier it contacts quite rapidly. Out in the deep ocean waters beyond the continental shelf zone surrounding Antarctica, the now warmer waters of this current can do little to effect the great ice sheets. Here Sunke’s study identifies the crux of the problem — the waters of the Circumpolar Deep Water are surging up over the continental shelf margins to contact Antarctica’s sea fronting glaciers and ice shelves with increasing frequency. In some cases, these warm waters have risen by more than 300 feet up the continental shelf margins and come into direct contact with Antarctic ice — causing it to rapidly melt. This process is most visible in the Amundsen Sea where an entire flank of West Antarctica is now found to be undergoing irreversible collapse. The great Pine Island Glacier, the Thwaites Glacier and many of its tributaries altogether composing enough ice to raise sea levels by 4 feet are now at the start of their last days. All due to an encroachment of warm water rising up from the abyss. But the warm water rise is not just isolated to the Amundsen Sea. For Sunke also found that the warm water margin in the Weddell Sea on the opposite flank of West Antarctica was also rapidly on the rise. From 1980 to 2010, this warm water zone had risen from a depth of about 2100 feet to less than 1100 feet. A rapid advance toward another massive concentration of West Antarctic ice. The impacts of a continued rise of this kind can best be described as chilling. If this shoaling rate continues, there is a very high likelihood that the warm water will reach the Filchner Ronne Ice Shelf, with consequences which are huge. Filchner Ronne, like the great Pine Island Glacier, has been calving larger and larger ice bergs during recent years. Should warm waters also destabilize this vast ice shelf another 1.5 feet of sea level rise would be locked in due to its direct loss. Including the massive inland glaciers that Filchner Ronne buttresses against a seaward surge, much larger than the ones near the Amundsen sea, would add a total of 10 feet worth of additional sea level rise. Together, these destabilized zones would unleash much of West Antartica and some of Central Antartica, resulting in as much as 14 feet of sea level rise over a 100 to 200 year timeframe. This does not include Greenland, which is also undergoing rapid destabilization, nor does it include East Antarctica — which may also soon come under threat due to the encroachment of warm waters rising from the depths. Are IPCC Projected Rates of Sea Level Rise Too Conservative? The destabilization of glaciers along the Amundsen sea, the imminent threat to the Filchner Ronne Ice Shelf, and the less immediate but still troubling threat to East Antarctica’s glaciers, together with a rapidly destabilizing Greenland Ice Sheet, calls into question whether current IPCC predictions for sea level rise before 2100 are still valid. IPCC projects a rise in seas of 1-3 feet by the end of this Century. But much of that rise is projected to come from thermal expansion of the world’s oceans — not from ice sheet melt in Antarctica and Greenland. Current rates of sea level rise of 3.3 milimeters each year would be enough to hit 1 foot of sea level rise by the end of this Century. However, just adding in the melting of the Filchner Ronne — a single large ice shelf — over the same period would add 4.4 milimeters a year. Add in a two century loss of the Amundsen glaciers — Pine Island and Thwaites — and we easily exceed the three foot mark by 2100. Notably, this does not include the also increasingly rapid loss of ice coming from Greenland, the potential for mid century additions from East Antarctica, or lesser but still important additions from the world’s other melting glaciers. Such more rapid losses to ice sheets may well reflect the realities of previous climates. At current CO2e levels of 481 ppm (400 ppm CO2 + Methane and other human greenhouse gas additions) global sea levels were as much as 75-120 feet higher than they are today. Predicted greenhouse gas levels of 550 to 600 ppm CO2e by the middle of this century (Breaking 550 ppm CO2 alone by 2050 to 2060) are enough to set in place conditions that would eventually melt all the ice on Earth and raise sea levels by more than 200 feet. For there was no time in the past 55 million years when large ice sheets existed under atmospheric CO2 concentrations exceeding 550 parts per million. Glaciologist Eric Rignot has been warning for years that the IPCC sea level rise estimates may well be too conservative. And it seems that recent trends may well bear his warnings out. If so, the consequences to millions of people living along the world’s coastlines are stark and significant. For the world, it appears we face the increasing likelihood of a near-term inland mass-migration of people and property. A stunning set of losses and tragedy starting now and ongoing through many decades and centuries to come.